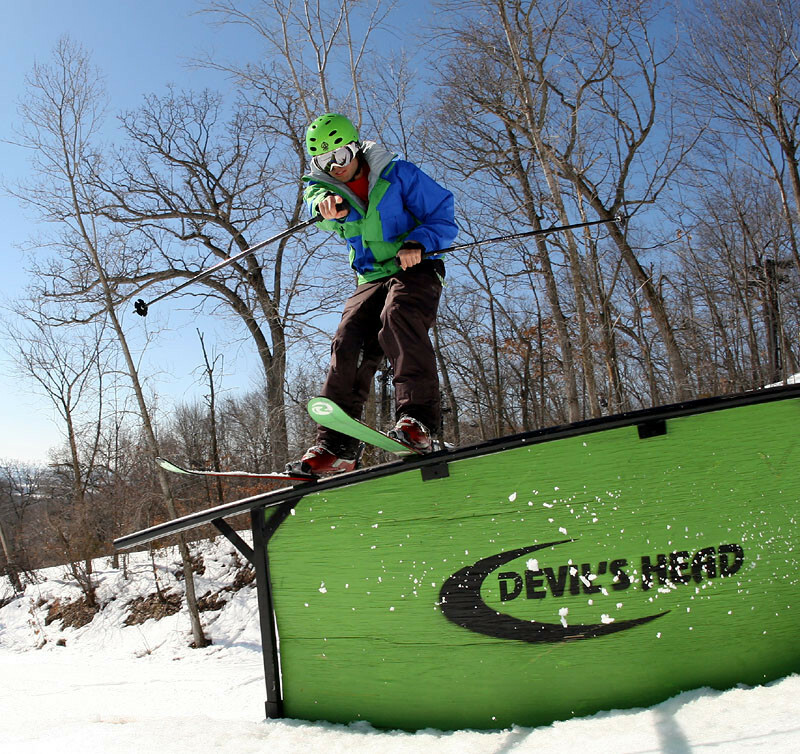 Devil’s Head, located in the beautiful Baraboo Bluffs region of central Wisconsin, boasts a 500-foot vertical drop, over 30 runs scattered across 250 acres, 16 lifts, five restaurants and more than 250 guest rooms. It’s a big resort by Midwest standards. Located just three hours from Chicago and a little over half an hour from Milwaukee and Madison, it’s an easy drive. The resort’s strengths are long blue cruising runs that are impeccably groomed. Step out of your lodge room at 8:30 a.m., or in the evening after 6 p.m., and you’re guaranteed to find miles of impeccably groomed, corduroy-like runs. What you won’t find here is much knee-knocking steep, but kids love the several terrain parks scattered around the resort. Skiers give it high marks in the areas of service, lodging, dining and après-ski activity; all the things that combine to make for a great family ski vacation. With all of the buildings connected by covered walkways, it’s easy to get around. Mom and dad can enjoy a leisurely dinner in the upscale Cornucopia Room while the kids go safely off to eat pizza and play games in another part of the resort. Ski lessons including kid's programs, ski patrol, child care, experienced instructors, and rental shop with new ski and snowboard rentals. Cafeteria, family restaurant, fine dining restaurant, sports bar, restaurant/bar, weekend bar and grill, and weekend snack bar. One hundred percent snowmaking.